It is nice to see the technology and wonders miniaturization of a device can do for us humans – check out the Muvi Micro Camcorder that is able to do more than what a high end analog camcorder is capable of more than a decade ago. 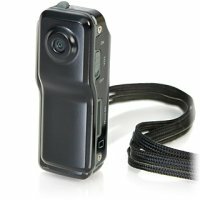 Being super small, it measures a mere 5.5cm x 2cm x 2cm, making the manufacturers tout it as “the smallest camcorder in the world” – heck, you can even wear it around your neck and let it function like a webcam if you want to. All recorded images and videos are stored on a microSD memory card, where it is expandable up to 8GB. Features include VGA resolution recording quality and the ability to record using voice commands. Heck, you can even let it be sound-activated, recording whenever it detects a sound of 65 decibels and above. Interested parties can pick up the delectable Muvi Micro Camcorder for £79.95. Last week’s Coolest Gadget is…. BEFORE BUYING, WANT TO BE CERTAIN THAT IT RECORDS CONVERSATIONS AS WELL.